Incredible view of Zion Canyon and the silver meanders of the Virgin River. Take a shuttle tour of Zion Canyon. From April into November the only way to drive through the canyon is on one of the park service’s shuttle buses; these run regularly throughout the day. If you want to forget your car completely, you can leave it in Springdale and catch the Springdale shuttle to the park visitor center then catch the Zion Canyon shuttle bus. Join a ranger-led hike on Weeping Rock or Riverside trails. 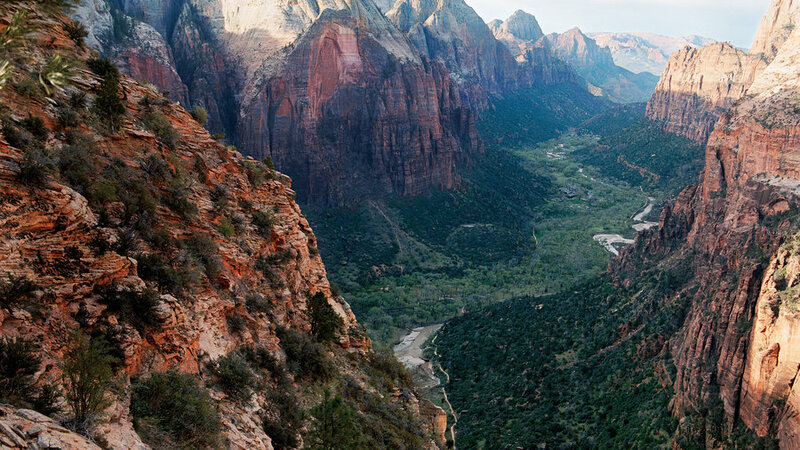 Zion Canyon is starting point for Zion’s most popular hikes, including the easy Riverside Walk and Weeping Rock trails (see Zion Hikes); throughout summer you can tackle many of these trails on ranger-led hikes. You can also explore the canyon on horseback; visit . Drive Zion-Mt. Carmel Highway. As spectacular as the road into Zion Canyon, the 10-mile route between Springdale and Zion’s eastern boundary gives you broad views of Zion’s gorgeous geology; highlights include Checkerboard Mesa and Canyon Overlook. Gallery hop in Springdale. Zion’s carved and colorful cliffs and canyons have inspired artists and photographers for more than a century, which is one reason this part of Utah has a concentration of good galleries. In Springdale, visit the Worthington Gallery (789 Zion Park Blvd; 800-626-9973) and the David Pettit Gallery (975 S. Zion Park Blvd. ; 435-772-0533). East of the park, in Mt. Carmel, the hand-built cabin of famed Western artist Maynard Dixon is open for tours from May to November (from $10; reservations required; 435-648-2653); their annual Maynard Dixon County Festival runs in August for information visit ).